Content marketing is changing. It has always done so, and will always continue to do so. There will always be new topics to discuss, audience preferences will change, social media platforms will evolve and new ones will emerge, and that’s just on a macro level. Each business that engages in content marketing will have to continually adjust their approach and content to continue meeting their customers’ needs. With all of this change, it seems like digital marketers need some consistency. They need an unwavering set of guidelines to reference no matter what the current trends or business needs are. Good news! This gold standard exists. 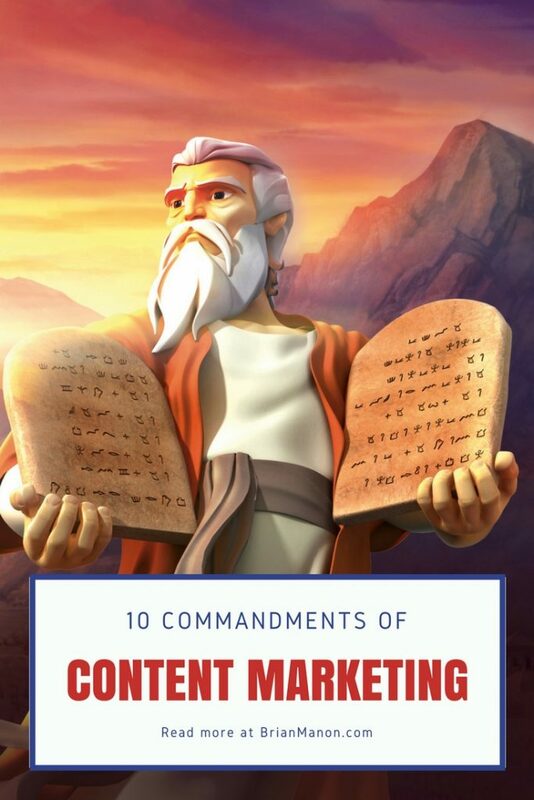 Here are the ten commandments of content marketing. So, yours is the most trusted bicycle shop in the state of California? You’ve received a consumer associated reward for business owner of the year? Your products are the safest and they last the longest? That’s great! Now prove it! Audiences are skeptical. Many have been burned by dubious claims before. None are going to be impressed with your claims unless you back those up with data. What does this mean? If you make a claim about your product, your company, even your competitors, you need to back that up. Bring on the data, the links to reputable sources, and the case studies. Providing evidence makes your audience trust you. First, your content should never induce headaches or eye strain. Space things out. Use numbered lists and bullet points. Think about your mobile users. You won’t reach anyone if your content is a wall of text that drives people to click away. That isn’t all. Your content shouldn’t be challenging to read either. The idea is to inform, educate, entertain, and inspire, while keeping things simple. Use short sentences. If you have a choice between a simple word or phrase and a complex one, always choose the simpler option. As a general rule, your content should be written at the 6th to 8th grade reading level. You aren’t dumbing things down. It’s possible to address very complex topics in your content while still making sure anyone can read it and understand it with little effort. Consuming your content should be a breeze. Content that introduces your company, story, an overview of your products and values for customers in the earliest stages of the sales process. White papers and eBooks for audience members who prefer to dig deep into information before making a decision. Product demonstration videos and question and answer content for consumers who have expressed specific needs regarding your preferences. Troubleshooting guides, best practices, and user generated content for audience members who have already made a purchase. The chances are slim to less than none that a blog post, article, infographic, or video is going to attract lots of views, comments, or shares on their own. Even your subscribers and most loyal followers may miss great content that you post and share. You cannot afford to wait for people to find your content. You have to promote it. Promote your new content on social media. If your audience is on a 24/7 news cycle you need to be as well. Fortunately, there are tools you can use to promote your content on social media on a daily basis. You can also take part in social media conversations as a means of promoting and linking to your content. People have preferences when it comes to how and where they will consume their content. On top of this, you have to remember that your audience members get the most out of different forms of content. Here are some general tips to ensure that your content and delivery of the content is appealing. Reach out with both long and short form content. This should range from Tweets to White Papers. Share content on a variety of social media platforms. Engage your audience with live streaming content. Incorporate visuals into your content. Use different formats. Try out infographics, podcasts, and interactive content such as quizzes and polls. Think in terms of what your audience needs to know, and how they want to get that information. For example, an online legal service specializing in international business might create a monthly email digest with information on finding the best business translation companies, locating great hotels for business travelers, and international business etiquette. Over time, every company develops a personality. This doesn’t happen by accident. That personality is your brand, and you’ve worked very hard to cultivate it. Part of your branding is expressed by the voice you use in your content marketing. That voice needs to be consistent across all of your marketing content, and it should contribute to your overall branding efforts. By doing this, you ensure that your content marketing efforts contain the elements that make your company appealing to your core audience. For examples of companies that are doing an excellent job at this, check out the efforts of REI, Jack in The Box, Red Bull, and Starbucks. Each does an excellent job in ensuring their branding comes through in their written content as well as their visual content. Informing and educating through instructional content such as how to videos. Inspiring by creating and sharing content that reflects your company’s mission, story, or that tells inspirational stories about others. Solving problems by recognizing the concerns of your target audience, and then producing content that addresses that. Providing entertainment. It’s perfectly fine to create and curate content that is solely for the entertainment of your target audience. Yes, it’s fine to share news about new products, special offers, or other promotional content. Just remember that those posts are not why your audience continues to engage with you on social media platforms. Most content marketers engage in a combination of content creation and content curation. On the creation side, you may create blog posts, articles, infographics, and a host of other content. On the curation side of things, you’re constantly on the lookout for content others have created to boost your content marketing efforts. Then, you share that content with your audience in hops that it will resonate with them. Content curation is wonderful. It helps you to reach your target audience with more content that is relevant to them. It also contributes to the greater good by helping the people who create that content gain more exposure and possibly increase their bottom line as well. Of course, the latter only happens when content creators receive credit for their work, and proper permissions are obtained. It may not seem like a big deal to share an uncredited, article, meme, or quote, but imagine being the creator of something that goes viral without getting any credit. If you share something, make an effort to identify the creator, give them credit, and ask permission to use what they have created. This is all about community and conversations. Your company should never be the only one talking. This starts with social media engagement. When your blog posts, Tweets, Snaps, Facebook updates, and Instagram pictures garner comments use that as an opportunity to encourage ongoing dialogue. This should happen between your company and your audience, but between your audience members as well. Commenting is just the beginning. Here are some other ways to give your target audience a voice. Create user forums where audience members can share experiences, tips, troubleshooting information, and more with one another about your products and services. This is a great way to identify power users and brand ambassadors. Encourage users to submit stories and videos to your social media pages. Highlight the best on your website. Create hashtag campaigns, giveaways, and social media contests. This will get people excited about engaging with your brand, and spreading the word. The importance of quality cannot be overstated. Everything that you publish for public consumption should be polished and perfected. Written content should be factually accurate, free from spelling and grammatical mistakes, formatted in a way that is attractive and readable, and should include relevant images. All images, no matter where they are sourced from should be clear, optimized, and the highest quality possible. Video should be shot and edited using the best equipment available to you. No matter what, there are certain rules and standards that should always apply to content marketing. Treat these ten commandments as your foundation, and you will always reach your target audience with content that resonates with them. Thanks for these great tips! I’ll definitely keep them in mind when producing blog posts! Loved the tips, and I’m keeping in mind for my bog! I always have to remind myself how many people are reading recipes on their phone! Great informative post! Much need tips, too! Thanks! Very good information. I’m saving this on Pinterest too for other bloggers! !